Trap Ease Artist is a 4-player minigame in Mario Party 6. The minigame name is a pun off "trapeze artist". There is also a page containing this minigame in the Miracle Book, named "Golden Goomba". In Party mode, it is one of four mini-games exclusive to daytime, the others being the Donkey Kong mini-games. It reappears in Mario Party: The Top 100. 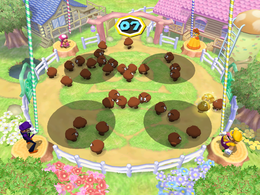 The introduction shows the first player dropping the cage, trying to trap some Goombas, showing the player how to play. 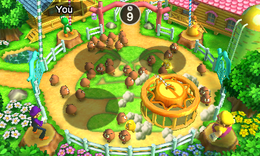 The main point of the game is to trap as many Goombas as the player can with their cage. When many Goombas are under the cage's shadow, one must press to drop the cage, trapping the Goombas. Regular Goombas give the player one point, but Gold Goombas give them three points. After all of the Goombas are captured, the player with the most points wins. As soon as all players have dropped the cages, they open. The Goombas inside then leave the cages as the player's tallies increase. The winner(s) then do(es) their victory animation. Rules – "Drop a cage to capture as many Goombas as you can! Whoever earns the most points wins!" Advice 1 – "Normal Goombas are worth one point. Golden Goombas are worth three points.'" Advice 2 – "Don't wait too long for a better chance to drop the cage, or you may miss your best opportunity!" Description – "Drop your cage at the right moment to capture as many Goombas as you can!" On-screen – "Drop the cage to capture Goomba!" In the PAL version of Mario Party 6, Trap Ease Artist does not appear in Endurance Alley. This page was last edited on December 26, 2017, at 20:58.